Previous Post What Do I Expect From A Nanny? Next Post Mom It Down: Awesome Chocolate Chip Cookies. Mommy, I went all by myself! how do you like them yams! It is? But FreshDirect said YAMS. WE ORDERED YAMS NOT SWEET POTATOES. THAT’S IT. I’M WRITING AN ALL-CAPS LETTER. Sweet potato tea party with Elmo. no..it’s a yam! Sweet spuds are yellow-fleshed, I can see the orange yam through the skin. Crap! I can’t make sweet potato fries out of a yam, can I? I saw Laura’s comment, did a quit bit of research, decided it was indeed a sweet potato and switched cooking gears. Decided I’d make fries with it. They are getting all coated in lovely goodness as I write this. NOW WHAT PEOPLE OF THE INTERNET? NOW WHAT??? I never make dinner and I decide that this time I will and LOOK WHAT HAPPENS! For the record, yams make great fries too. Elmo: Y is for yam. 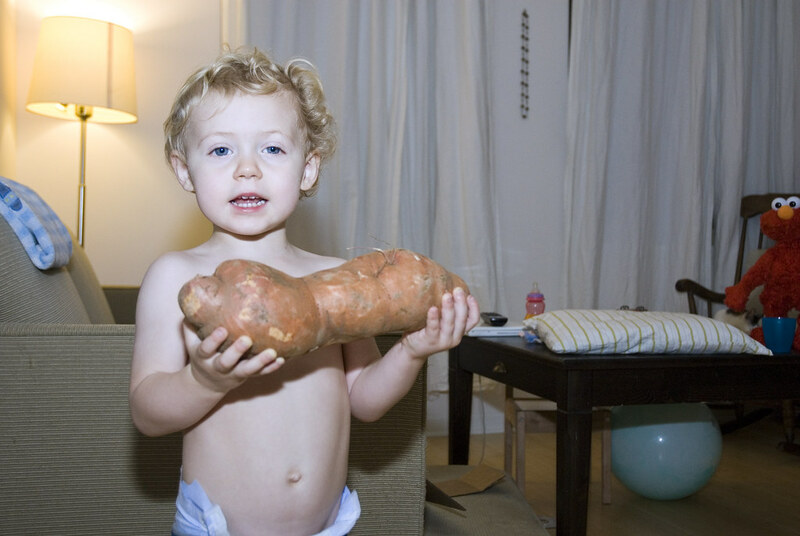 Emory: Why is this yam so big? Ok..I don’t have anything clever or witty in my brain at the moment for the caption this but I just had to ask you about a past post. You posted some new shoes you got and I can’t find it anywhere! I loved them and was hoping for something similar…what were they called? Midway through. I LOVE THEM. I do hope your doing well? Your web site says: I can buy one. But I can’t find it on your webpage. Cheryl: That made me laugh out loud. Thanks! That is most definitely a yam. You can make delicious fries out of them too. Here is the yam I promised. Now where is my bride in return?